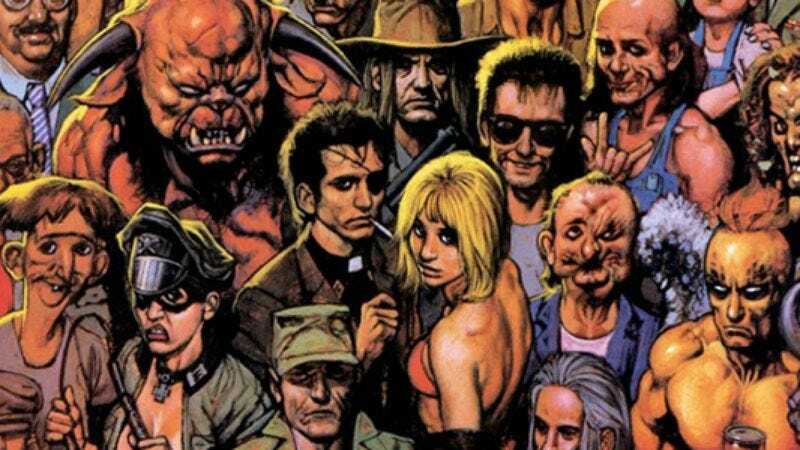 Things seem to have finally come together for AMC’s Preacher adaptation—most of the cast has been assembled, with Agent Carter’s Dominic Cooper and Ruth Negga (Marvel’s Agents Of S.H.I.E.L.D.) set to play Jesse Custer and Tulip O’Hare, respectively. Joseph Gilgun (Misfits) is on board as Irish vampire Cassidy, and Rake’s Ian Colletti will slap on some prosthetics to play Arseface. True Blood’s Lucy Griffiths—who was scrapped from NBC’s Constantine after starring in the awkward pilot—will also appear as Jesse’s friend Emily Woodrow, a single mother with a thing for the preacher. But because TV projects have a way of falling apart, we weren’t truly confident about the show making it to (digital) air until we saw the first set photo shared by Preacher producer and writer Seth Rogen. Rogen somewhat satisfied our curiosity and stoked our interest in the show when he shared a picture filled with silhouettes on a dim set—which, let’s face it, might be the best lighting for Arseface. If you head to the page yourself, you’ll also see plenty of pictures of the mission that will presumably serve as Jesse’s church for the pilot. Rogen was also photographed on the set, in mid-Seth Rogen laugh.